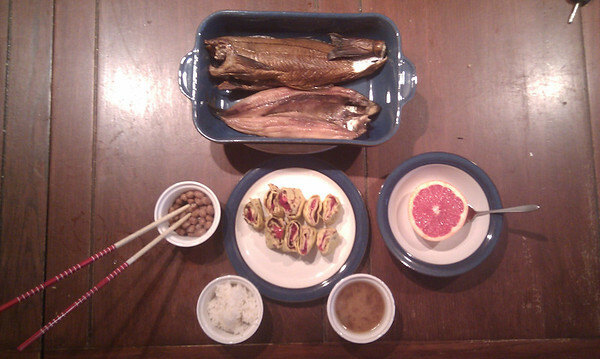 NeverSeconds: My Argyll Japanese Breakfast. I think you did a great job! I give you a 9/10 copy rating because it looks the same. It is all very healthy too so 9/10. I am sure it was perfectly tasty so 10/10. I also know you are careful so NO HAIR!! I hope you are having a nice holiday! Seattle says HELLO! The raspberry pancakes look like my son's favorite treat! Copy rating - 7/10, due to the fact that certain items were replaced with equivelents. Even in my large town, some of the ingredients would be impossible to get hold of, so I couldn't even make it exact. Effort - 10/10, you must be congratulated on your attempt to replicate the meal with what you could find. Food-o-meter - 9/10 because it is certainly more healthy than bacon and eggs and fried bread! Copy-o-meter - I'd say 9/10 for the best possible copy you could make from what's available to you. Well done. Quick, somebody send Veg some natto! Loving the fact the fish is from Tarbet as I am up there on holiday at the end of the month (well just up the road at Scourie)so it has made me very excited. (Tarbert - Loch Fyne, just down the coast from Lochgilphead. Tarbet - half way up Loch Lomond near Arrochar. I'll give you a 10 for your copy, Veg. I think your substitutions for things you couldn't find locally were great. Did you know there are knives with serrated and curved blades that are made especially for cutting the sections in grapefruit? There are also "grapefruit spoons" that have little serrations on the end of the spoon to make getting those sections out easier. What a brilliant idea! I want to make that for breakfast too... I wouldn't need to eat again until teatime. It's so good for you, too. Foodometer: 9/10 - I want to eat this right now. Health rating: 10/10 - nothing fried or slaked in grease, and you have lots of different food groups (even some fresh things). Copy-ness: 10/10 - I can't fault your presentation! And a great idea to substitute your local ingredients! The hardest item on the menu is nattō, which is a rather acquired taste for most both in smell and texture. Borlotti beans just can't compare. You would really have to find a specialty store that sells it. 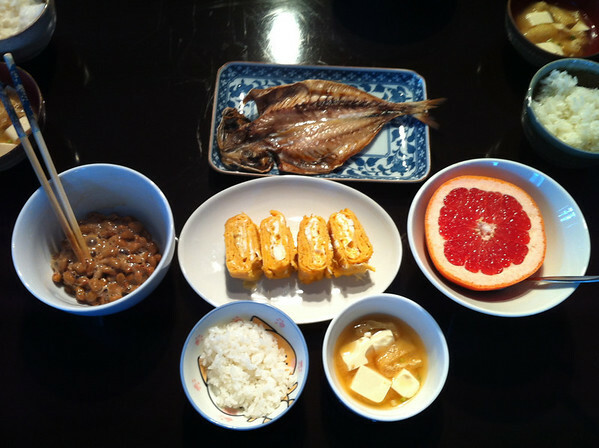 Shiho-san also mentioned using bonito flakes with the tamagoyaki. This is basically thin shavings of dried bonito and is probably only found at a specialty store as well. It's quite lovely alone sprinkled over rice. Also, the rice used for the meal also makes a difference, especially for the taste and texture (also easier to handle with chopsticks). A Japanese rice such as Koshihikari would be typical. Did you know that there are over 40,000 varieties of rice worldwide? It's quite a staggering figure. For the copy, I'd go for 7/10. But it's still a very good effort considering your limitations and location. Well done, VEG! A side note: The Japanese usually don't use a spoon with miso soup. They raise the hand-sized bowl to their mouths and sip it and use chopsticks for the bigger pieces in the soup. It is considered proper etiquette in Japan. If you were served a large bowl of ramen noodles, then a soup spoon is provided to use together with chopsticks. Hi Veg and Pavlova - great blogs from both of you. I love the food from around the world, and your stories Veg, about the food you get from your smallholding and from around Lochgilphead. As you are both interested in geography, maybe you won't mind my saying that actually, the closest national capital city to Perth Australia is not Canberra (3rd closest), nor Jakarta (2nd closest), but the capital of East Timor, Dili. How many seconds Veg? Well done, Veg. I'll give you an 8/10 for the copy because it can be really hard to replicate foods from other cultures, especially when the ingredients aren't readily available. I think your breakfast imitation looks great, VEG! Food-o-meter: 10/10 - it looks delicious. Copy-o-meter: 9/10 - though you had to change some ingredients, I think the main idea and the presentation were preserved. So, very good work! the problem you had with the Grapefruit is that you need a proper "grapefruit spoon" rather than a normal "Tea-Spoon" to eat one. Grapefruit spoons are shaped to suit the shape of the segments in the fruit. Plus they are serrated (sharpened) at the tip to help cutting the segments out of the rind. 10/10 for the copy- some ingredients not locally available, so substitution worked. I really liked Tarbet when we went there a few years ago.